Are you a college student this fall? Then this post is for you! Here's a list of dorm essentials that you will use your first year in college. Some dorm lists include lots of extra stuff you'll never use when you're away in your new dorm. But here are the absolute necessities you'll find yourself using almost every day. Scalloped Magnet Board Large - $36.50: I can't even begin to explain how important organization is in college. Between clubs, classes, and football games you'll need to have a place where you can organize your activities. Our scalloped magnet board is not only a great decoration, it'll keep you on top of everything. Laundry Bag Waffle Weave Monogrammed - $32.50: Sometimes keeping your laundry together at the laundromat is a difficult task. Our laundry bag will be sure to fit all of your stylish clothes and keep them safe from going missing. 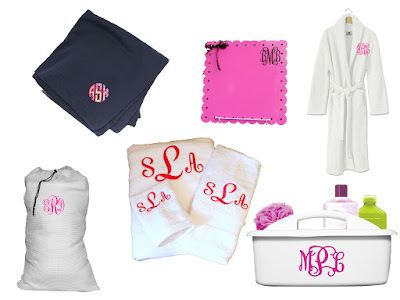 Monogrammed White Kashwere Robe Adult - $138.50: Treat yourself to a good robe. Seriously, do it. You might of not have worn robes around your house before but you will in college. Especially if you're living in a dorm where it's a community bathroom. Throwing a robe on is easy when you're showering, cold, or have to answer the door in the middle of the night. It's seriously one of the best inventions ever. Monogrammed Lilly Pulitzer Stadium Sweatshirt Blanket - $36: Dorms are cold. Always. The temperature in my dorm never went above 70 degrees. (Okay maybe I get cold easily...) Anyway, a good big blanket will get lots of use in your dorm. When it's cold in the winter, you'll be so glad you got one. Monogrammed Organizer Caddy - $30: Shower Caddies are lifesavers when you're living with community bathrooms. They keep all of your bath supplies together (And if you're anything like me, you have more than enough). Plus who doesn't want to look super cute as they strut into the bathrooms? We hope you enjoyed this post! College is such an exciting time to discover who you are. Take advantage of every minute of it!